Nine air cadets* have received a shared grant of £90,000 from the RAF Charitable Trust, enabling them to complete the Sir Michael Knight Pilot Scholarship Scheme (SMKPS). Named in honour of Air Chief Marshal Sir Michael William Patrick Knight, the scholarship comprises a six-week residential course at Tayside Aviation, Dundee. The scheme costs just under £10,000 per scholar - the grant will pay for each of their training, exams, accommodation, food, equipment and transport throughout the course. Each scholar was selected for their flying capabilities and potential to achieve a successful career in aviation. To be eligible for the award, cadets must successfully complete an Air Cadet Pilot Scholarship (ACPS) and solo flight. The course will see the air cadets complete 33 hours SEP flying training and the subsequent Private Pilot's License examination modules, including Air Law, Operational Procedures, Principles of Flight and Meteorology. 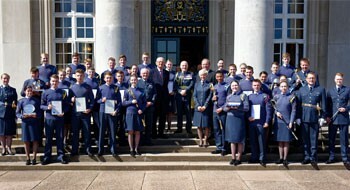 The nine scholars were formally recognised at the annual RAFAC Awards Ceremony at RAF Cranwell earlier this year, ahead of their residential course this summer. RAF Charitable Trust director, Justine Morton said: "The scholarship is a wonderful opportunity for these dedicated cadets - one that we are more than happy to facilitate. "We wish them luck with their summer training and can't wait to see them up in the air!" *The nine personnel that have been selected to undertake the Air Chief Marshal Sir Michael Knight Flying Scholarships 2018 are: CWO Matthew Osbourne, FS Richard Hopkins, Sgt Kane Crouch, Sgt Paul Stephenson, Sgt Adam Warrington, Sgt Lauren Cardwell, Cpl William MacMillan, Cpl Richard Gibbs and Cpl Angus Turnor.